St. Martin's Paperbacks, 9781250318848, 464pp. Famed and brilliant, Lady Alexandra Lane has always known how to look out for to herself. But nobody would ever expect that she has darkness in her past—one that she pays a blackmailer to keep buried. Now, with her family nearing bankruptcy, Alexandra strikes upon a solution: Get married to one of the empire’s most wealthy eligible bachelors. Even if he does have the reputation of a devil. 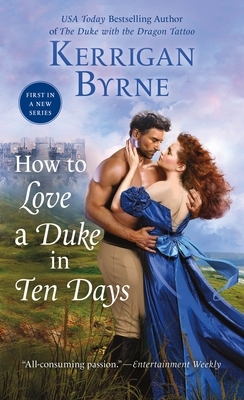 Piers Gedrick Atherton, the Duke of Redmayne, is seeking revenge and the first step is securing a bride. Winning a lady’s hand is not so easy, however, for a man known as the Terror of Torcliff. Then, Alexandra enters his life like a bolt of lightning. When she proposes marriage, Piers knows that, like him, trouble haunts her footsteps. But her gentleness, sharp wit, independent nature, and incredible beauty awakens every fierce desire within him. He will do whatever it takes to keep her safe in his arms. Kerrigan Byrne has done many things to pay the bills, from law enforcement to belly dance instructor. Now she's finally able to have the career she'd decided upon at thirteen when she announced to her very skeptical family that she was going to "grow up to be a romance novelist." Whether she's writing about Celtic Druids, Victorian bad boys, or brash Irish FBI Agents, Kerrigan uses her borderline-obsessive passion for history, her extensive Celtic ancestry, and her love of Shakespeare in almost every story. Her novels with St. Martin's Press include THE HIGHWAYMAN and THE HUNTER.